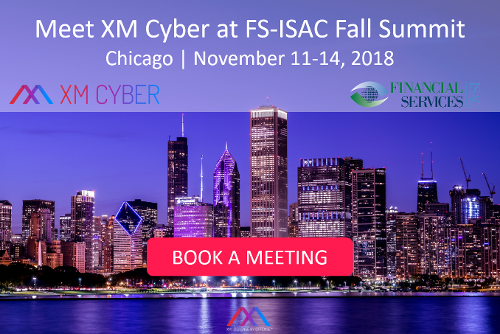 With thousands attendees from financial institutions anticipated to come this year, FS-ISAC Fall Summit 2018 taking place in Chicago, promises to be once again, an important event for the global cybersecurity community. At XM Cyber, we are particularly excited about this year’s event, as we will be sponsoring the “All Day Cafe” and attending FS-ISAC conference as a company for the first time. Our much-anticipated participation comes a few months after the company launch and transition from stealth mode. XM Cyber has already secured global partners and customers at the forefront of finance, manufacturing and critical infrastructure industries in the US, Europe and Israel. Finally, we’re looking forward to presenting XM Cyber at the FS-ISAC conference and showcasing the HaXM platform. HaXM by XM Cyber is the first site to simulate, validate and remediate attackers’ paths to your critical assets 24×7. HaXM’s automated purple teaming aligns red and blue teams to provide the full realistic APT experience on one hand while delivering vital prioritized remediation on the other. Addressing real user activities, misconfigurations and exploits, the full spectrum of scenarios is aligned to the organization’s own network to expose security blind spots and is executed using the most up-to-date attack techniques safely, without affecting network availability and user experience. The field-proven platform is simply and rapidly deployed in three simple steps, beginning with the selection of targeted assets, activation of ongoing attack scenarios and generation of prioritized actionable remediation, all in a continuous loop. Members of our team will be representing XM Cyber in the Solutions Hall, at the Cafe corner. We look forward to joining a host of innovative companies showing our APT simulation & remediation platform in action. Attending FS-ISAC Fall Summit in Chicago? Come meet our team and find out first-hand about our latest developments. Click below to schedule a meeting.